AOQUN Coffee Brushes is actually just the best, most comfortable and efficient way to clean your steam wands and portafilter spouts. 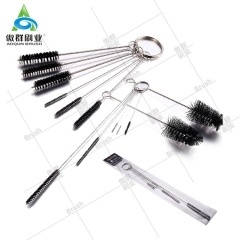 Heat resistant-bristles and ergonomic handle makes espresso machine cleaning easier, and make cleaning glass, gauges, and especially hard-to-reach pieces of coffee urns and other equipment quick and more fun. AOQUN coffee brush comes in handy for any coffee machine owner. Used to clean any hard to reach steam wand or automatic milk frother components.